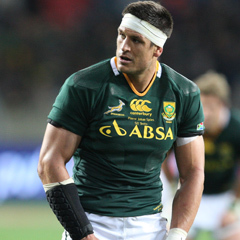 Port Elizabeth - Playing in his 50th Test for the Springboks, Pierre Spies said the side let themselves down in their 14-all draw with England here on Saturday. "England placed us under pressure and they wanted to come away with a result," said Spies. "We also wanted to win, but we just didn’t fire, and they forced us into errors and put our lineouts under pressure." The English dominated the tackle area, where they also slowed the Boks' ball. "It was certainly not our best performance as a group, and it is a pity because we really wanted to win all three games," he said. "There are a lot of things we can work on with an eye on the Rugby Championship." "We set high standards for ourselves and as a group we want to win all our games in SA," Spies said. "So, in that sense, we let ourselves down because we wanted a victory, even if it was by only one point, but we ran out of time." "The older you get, one changes and one is thankful that you are part of the set-up," he said. "But it also makes you realise that you have to change your game. "If I look at myself now, I am not the same player I was when I was younger or as brutal, but I am tougher and wiser in a sense."